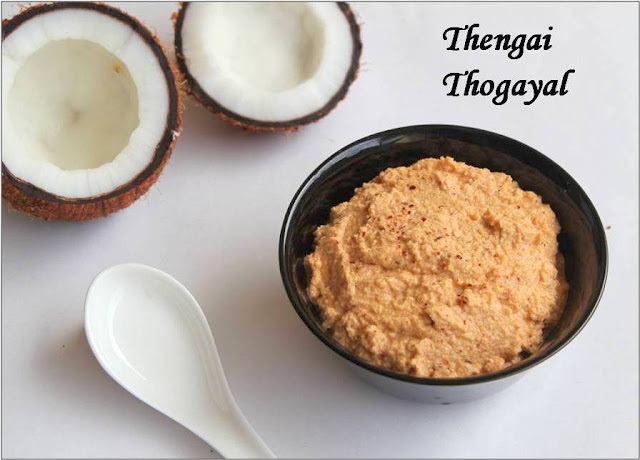 Thogayals are spicy and thick chutneys usually had with hot rice or idlis and dosas.This thogayal is usually made on the days when they made more kozhmbu in our house.Though nowadays we do not make thengai thogayal that often we cannot forget the lingering taste of it so i try to make it once in a while. 1 tbs of Gingelly oil. 1.Heat oil in a pan and fry the urad dal and red chillies till golden brown and cool it. 2.Grind the urad dal,red chillies,salt,tamarind and asafoetida first. 3. Add the scraped coconut and grind to a coarse paste. 4.Have it with hot rice and gingelly oil on top of it and may be with some more kozhambu. You grind the dal and the chillies first so that the spices spreads evenly. Instead of dry tamarind you can use tamarind paste. Your recipes are just like my mom's! I'm loving your blog and your food presentation is amazing! I tried the method you posted here. Thengai thogaiyal came out so delicious. i love this...it goes best with rice.